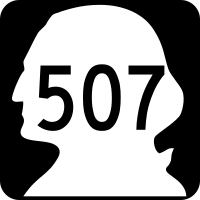 On Monday, April 3, 2017, we drove north on Washington State Route 507 from end to end. 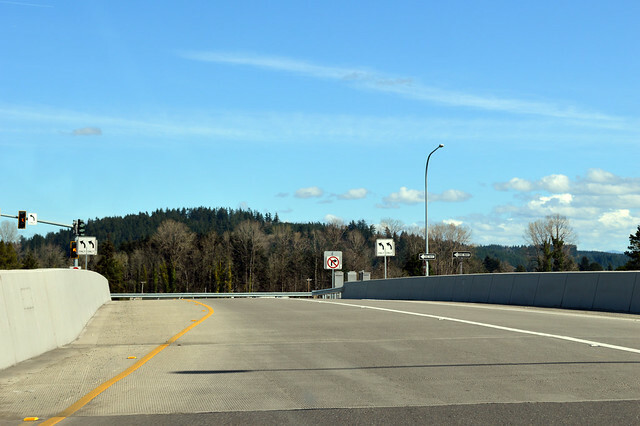 Just a couple years ago, WSDOT modified this interchange so the north (east) bound beginning is nearly a half-mile south of where it used to be. So old Mellen Street changed from two-way to one-way south (west) and our journey starts at this new bridge over I-5. 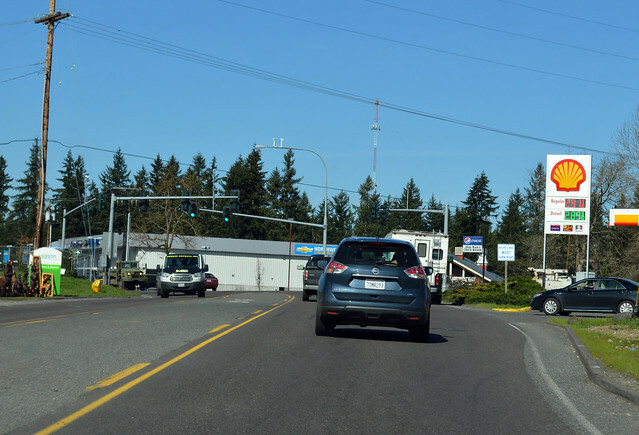 We start by turning north on a frontage road, until we're back to Mellen Street, then we turn east and head into Centralia. 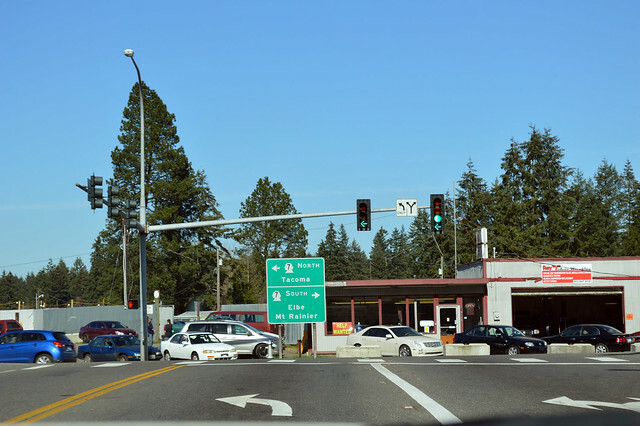 We slowly roll through the big, old downtown, a block from the Burlington Northern railroad tracks, but then we cross the Skookumchuck River and we're into farmland and residential. We cross the Skookumchuck again and we're flying north, parallel to the railroad again. But then we cross the Skookumchuck a third time and the highway turns into a lumpy farm road on its way to Bucoda, a small town where we rejoin the tracks. 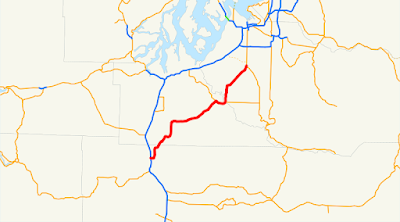 When we get to Tenino, we come to a T with old highway 99 (no longer a state route) and turn right, under the tracks. 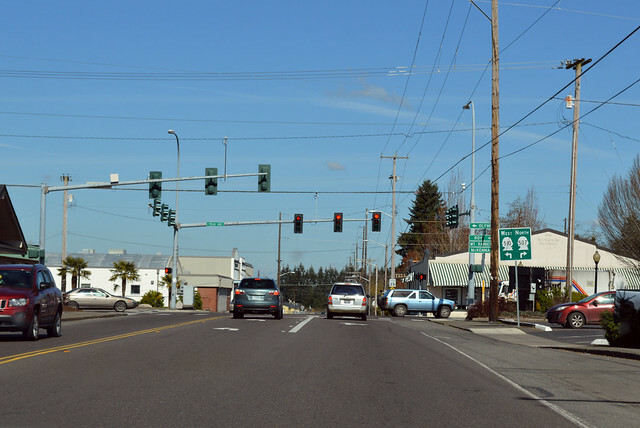 Tenino has an small, quiet old downtown, compared to Centralia. Old 99 curves left and Highway 507 curves right. We catch a glimpse of Mt Rainier as we accelerate out of town on the fast and straight highway. An old branch of the Burlington Northern, now a bike trail, is beside us. 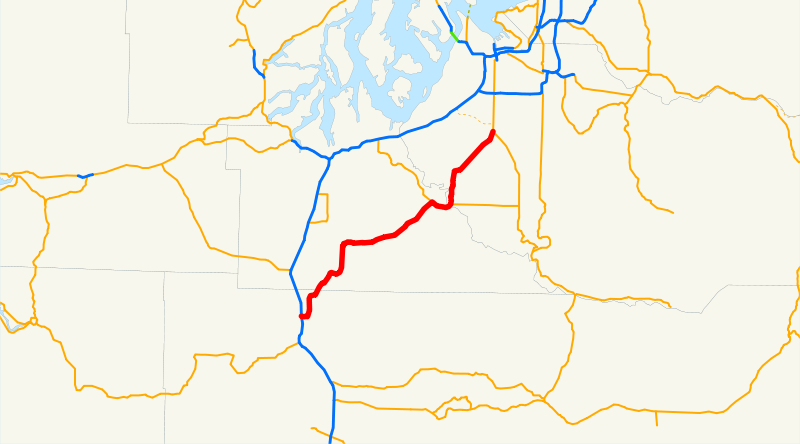 We zoom past a lake and river, a little slower through the town of Rainier, find an active railroad to cross (the old Chicago, Milwaukee, St Paul & Pacific), then we follow the rail trail through the hills all the way to Yelm and this junction with SR 510, where we need to turn right to stay on Highway 507. Yelm is big suburbia compared to everything before it. We get into a long line of cars behind an empty semi truck. The highway bridges over the still-active Milwaukee Road railroad then bridges over the Nisqually River. We enter the town of McKenna and find a junction with SR 702. We cross the Milwaukee tracks, then parallel them north. Mt Rainier looms on the horizon. We separate momentarily from the Milwaukee Road to go through the town of Roy, one-sided beside the Burlington Northern tracks. But we get back to the Milwaukee (crossing the tracks again) and roll north through the forest of Fort Lewis. The empty semi pulls off the road in the middle of nowhere, presumably to let everyone go by. After a couple odd street intersections in the dense forest, we abruptly emerge from the woods and arrive at the Y with SR 7. Welcome to Spanaway. It may take longer, but Highway 507 is more pleasant to drive than I-5. One can imagine the world before the interstate freeways, a nation tied together by winding two-lane roads following the twin steel ribbons that came before them. I've been enjoying reading these posts - when I started, I was living in Washington and loved it when your photos captured areas I recognized. Now, back in California, but still riding along with you for the journey. Thanks for this fun endeavor!